I’m 36. One of my best friends is 84. I try to live in the moment, knowing our relationship might be a fleeting one. I read this article and found it very interesting, thought it might be something for you. The article is called Ned and I and is located at http://modernloss.com/ned-and-i/. Recent census figures show Maine has the highest median age in the country, making it the oldest state, or, the state with the oldest population. Which means I live in a state that has more people dying in it each year than being born. I live on an island called Peaks. It’s only about 3.5 miles long and around, and while in the summer the population spikes to the low thousands when the summer residents and weekend trippers arrive, the year-round population of Peaks Island is only about 500 people. In the dead of winter, that number feels more like 35 or 40, or sometimes, deep in February, at 3:30 in the afternoon when it is already dark outside, one. Given all these ingredients, it was no surprise when I met my new best bud on Peaks Island, and that he happened to be 84 years old. Ned and I share a lot of common ground. We like to talk about books, we recite excerpts, we recommend books to one another, we trade books. We share newspapers, we share magazines. We cut out articles from The New Yorker and put them in one another’s mailboxes. Ned and I are both authors, too, both having written memoirs. Mine’s about loss. Ned’s is about that one time he was a deep sea explorer with Jacques Cousteau. If you were to see us together, you might think Ned was my dad, or possibly my grandfather. Maybe you’d assume I hang out with Ned out of a sense of duty to the elderly, as if I were attempting to get my adult Girl Scout badge. Or that I wanted something from Ned. While I do believe it is our moral duty to be a social lubricant to anyone who might be feeling lonely or obsolete, this is not the reason I hang out with Ned. I hang out with Ned because Ned is my friend. Ned and I like to talk about the places we’ve been, the countries we’ve visited (he has about 47 on his list already), the countries we want to visit next (consensus: Iceland.). Ned has slept on Greenland’s ice floes on broken down cardboard boxes, has climbed 10,500-foot glaciers, and he still sails his 19-foot sloop, the Aurora III. In other words, the man has lived. During the 2016 presidential campaign, Ned and I took a boat to the mainland to protest Donald Trump’s visit to our city. Then Ned promptly attended a summit on the mainland on the topic of Arctic exploration, because he didn’t have anything better to do that day. Recently, my ten-month-old daughter Simone, Ned, and I took a road trip to Unity to attend Maine’s Common Ground Country Fair. Halfway there, we stopped at Moody’s Diner for two slices of four-berry pie and some black coffee. Simone stuck her finger in our whipped creams. We got stuck in a traffic jam for about an hour, but when we got to the fair after nearly three hours in Ned’s Subaru, we walked another half mile or so through a pine forest until we got to the grounds. It drizzled a little, and we spent the day wandering around the fair, running our fingers through the alpaca yarns, knocking on the wood stove displays to check for quality, eyeing the prize-winning tomatoes and giant onions. “Most of my friends are dead,” Ned said casually as we were walking past the sheep dog demonstrations. When the sun started to set, we went to go buy some sauerkraut before heading home. Ned drove, and I thought a little bit about death. We were hungry and weary but invigorated by the brilliance of the day, all the different looking people we saw, the energies, the smells, the life. Before stopping for clam chowder, Ned and I talked a little bit about this and that, but I was starting to feel a little melancholic and wasn’t sure why. Maybe it was the heavy feeling of autumn approaching or the unfamiliar big crowd. Simone had fallen asleep and aside from her little mouse snores, the car was comfortably quiet. “So,” I began. “Ned, suppose something were to happen to you. I mean, if I didn’t hear from you for awhile, and, well, you live alone, and winter is coming. . . well, do you have anyone who is checking in on you? Should I be that person, Ned?” I was stuttering and must’ve sounded ridiculous and silly, but I didn’t quite know what I was trying to say, or ask in the first place. Ned wasn’t sick, and he is not frail. He his health isn’t ailing, either. He walks everywhere, with a backpack slung over just one of his shoulders, and stay can stay up later than I can. Ned is social and curious and is constantly exercising his brain and body. To boot, Ned’s a Christian Scientist, doesn’t take Tylenol for a headache, can’t remember the last time he saw a doctor. I’m 36, and when I tell Ned that I think he should come to acupuncture with me sometime, he politely declines, and I know he thinks I probably believe in magic. So I’m not worried about Ned, but at the time, I was wondering if I should be, or if I should be doing something, I don’t know, preventative. “Ha!” Ned laughed. “You’re a love, dear, and I do appreciate your question and concern.” He told me not to worry, then pulled out a chain from under his collar and explained it was some kind of GPS alert necklace he can press if he becomes incapacitated and is alone. “It’d just rather have this with me than not have it with me if I were to go headfirst down a flight of stairs.” He is pretty prepared and legally, his ducks are in a row. But other than that, there’s nothing anyone can do. I had wanted to ask a question, to talk about something bigger than myself, bigger than my friendship with Ned, but I wasn’t sure what. A few nights after my trip to Unity, I lay awake thinking in bed. More than anything, I still had this strange, unfamiliar feeling I’d picked up after the fair that I couldn’t shake. It was a feeling that made me feel worried, like I should keep my joy in check, but one that was also sort of beautiful. Because our day at the fair had been beautiful—timeless and pristine, effortless and peaceful, like my friendship with Ned. But that day had also stirred up some feelings, some worries. As I lay there trying to untangle what was causing my unrest, I realized that it wasn’t Ned I was worried about. I was worried about myself. And I was just worrying. I was worrying about the inevitable fact that this new friendship was not going to last forever. Ned was 84, and we were just in the beginning, as they say, of a beautiful friendship. I hadn’t lost a close friend before. I imagined the day in the future when there would be no more Ned, and how this would be a fact, and felt like I’d been kicked in the gut. Because there was nothing I could do. How does one prepare for death? And should I be preparing for it? Should I be thinking more about it? Should there be a warning label before I open the box to another relationship with someone older than I? The answer I’ve decided on: no. To treat my friendship with him like it has a fast-approaching expiration date would be like dating someone only to assume they were going to break up with me at any moment, or getting married only to assume that divorce is around the corner. To live a relationship in fear would cause it to be too precious or brittle. And then it would definitely break. When I think about how Ned most likely wouldn’t be in my life in fifteen years, it makes me sad. But when I keep going down that dark, huge tunnel of thought, more thoughts follow, like how it’s possible I might not be around in fifteen years, either. Or in a week, or tomorrow. So why was I so shocked when I realized this? Because we live trying to avoid thinking about death. We tiptoe around it; we don’t stomp through it. After visiting the Common Ground Country Fair with all its timeless humanity, while sitting in a car with a ten-month-old baby and an 84-year-old man, I had a moment when I realized, stopped, and acknowledged we are all dying, and we will all die. So then what? We let life go on. We let that thought pass. We open ourselves up to all possibilities, even if they’re not what we planned and don’t come in the package we expected during the time we’d anticipated. One of the best things that happens when I am around Ned is that I remember to live, regardless of whatever superficially might feel threatening or impossible. When I’m with Ned, I get out of my head, I look at his life, and this is what it tells me: you live, you are prepared, and you keep going. The rest will fall into place on its own. 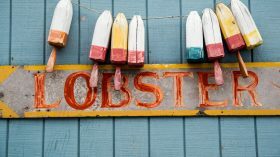 Ned and I took another road trip in October, before the lobster shack in Ogunquit closed up for the summer. He and his late wife Ellie used to go each year for their anniversary. Ned was planning on going alone, but I told him that he’d better plan on taking me with him. 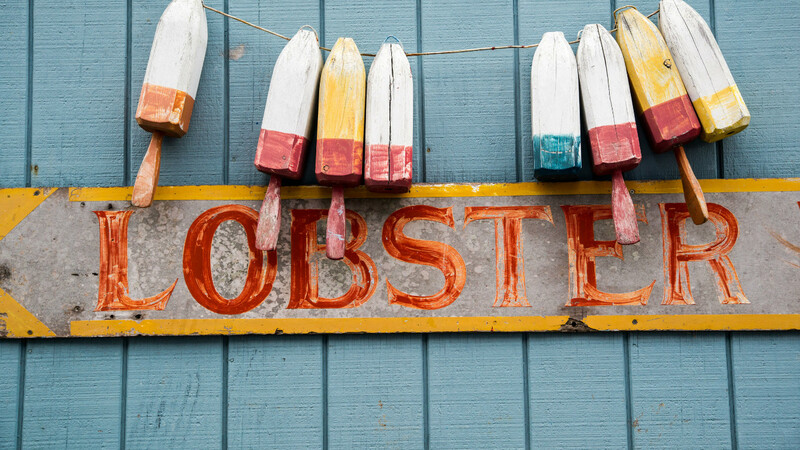 That day, we got off the island and went to a shack where we wore plastic lobster bibs and broke open their shells before dipping the lobsters in melted butter. Then we drove back home, bellies and hearts full, hoping to return next year when they open back up for the season. Mira Ptacin is the author of the critically-acclaimed memoir “Poor Your Soul” (Soho 2016). Please visit her website at www.miraMptacin.com.